Most participants in Timothy Seidel’s workshop were captivated by the humorous image. In one drawing, a huge fish chased a school of smaller fish. In the second, tables had turned: the smaller fish were chasing the big fish. 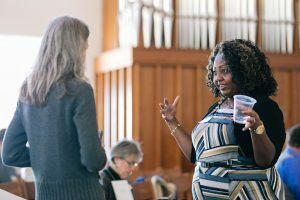 “That second image there is what I think of when I think of community organizing,” Seidel told the group, gathered for the afternoon session of SPI Community Day at Eastern Mennonite University. Good conversation is always a part of SPI Community Day and Summer Peacebuilding Institute. One thoughtful middle school teacher, who had driven several hours from Lancaster, Pennsylvania, had a different observation. Amid much laughter, there were also nodding heads. The interaction was SPI Community Day in a nutshell: thought-provoking discussion in an educational environment that emphasizes practicality and the experiences of those in the classroom, undergirded by the positive energy (and often good humor) of face-to-face interaction. Seidel’s workshop was one of seven offered during the one-day event, which gave approximately 85 participants a taste of the learning opportunities and warm friendly environment of “SPI,” or Summer Peacebuilding Institute. Register for Summer Peacebuilding Institute. Since 1994, more than 3,200 people from 120 countries — and a wide variety of professions — have attended the summer program, gaining concrete strategies and practical skills in organization, facilitation, reconciliation, restorative justice, participatory arts, trauma awareness and much more. 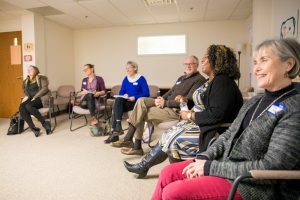 During its four sessions in May and June, academically credentialed practitioners teach five- and seven-day courses that can be taken for personal skills growth and training or academic credit. Three-day workshops are also offered. One of those practitioners who will teach this summer kicked off the Community Day event. Ram Bhagat will co-teach a STAR course at SPI this summer. 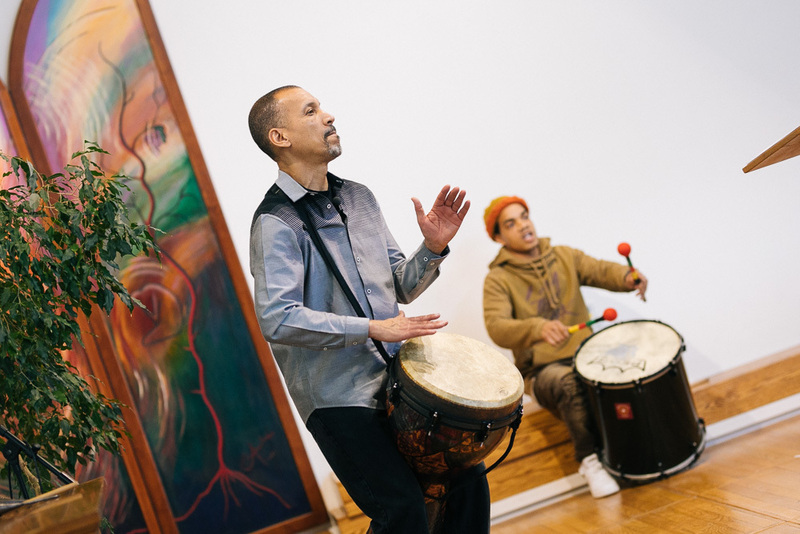 A drum welcomed the group into Martin Chapel for a keynote address, interspersed with guided meditation and a lecture on racial healing, by Dr. Ram Bhagat, a Richmond-based educator and founder of Drums No Guns. 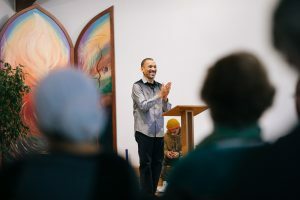 In 2016, Bhagat was named Richmond’s Peacebuilder of the Year by the Richmond Peace Education Center. Bhagat, currently earning a postgraduate certificate in restorative justice, will teach Strategies for Trauma Awareness and Resilience (STAR) at SPI this summer. Miller’s middle school a few miles outside of Harrisonburg is working to instill a restorative culture model. Two teacher-leaders from Montevideo accompanied him to SPI Community Day. Conversation during a coffee break. 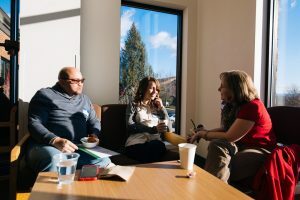 He added that the concept of “quiet centeredness,” taught in a peace education session with Dr. Ed Brantmeier, of James Madison University, was also useful in addressing conflict and wrongdoing. Brown, of Westwego, Louisiana, combined his SPI Day experience with an exploratory visit to Eastern Mennonite Seminary. A career coach with the social enterprise-based organization JUMA Ventures, Brown introduces young adults ages 18-24 to career planning, employability and financial management skills and part-time employment. Brown also appreciated the awareness and recognition of historical and systemic discrimination and oppression of people of color. Workshop topics ranged from organizational leadership to the principles of peace education. Barge, a regular attendee of the summer institute, offered SPI Community Day as a professional development opportunity. Two staff and two Big Sisters attended.